Just because man has created religions that separate us on earth, does not mean it separates God or that it separates us from God. Religions were created to explain the unexplainable, to name the unnamable. 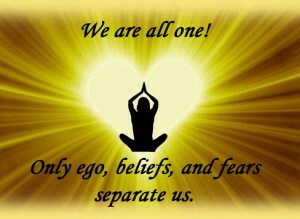 Separation does not come from God, it comes from the flawed human ego. When one removes the earthly “EGO” concepts of the right way or the wrong way and simply chooses and practices a path solely to connect oneself with God, the separations no longer matter. The primary purpose of religion was supposed to be a connection to God. It is the road one takes to find that connection to source. When we drop all the dogma and religious bindings what is left is God. A simple connection to source that is the starting point for everything else. In recent weeks it has been a matter of some chagrin to me that my Yahoo! News feed keeps bringing articles from major outlets that prove in my estimation to have far less merit than my own; while my own work continues to be ignored. Frankly, it seems to me that my work is on a par with that of the Washington Post columnists. I see myself as in that league. If I can find my way there, my goal would be not so much to set forth my own views, as to alter the direction of public discourse; to influence, perhaps even at a national level, the way people talk about the great questions of our time. There is a widespread belief among Jews, that Chrstian translators routinely falsify their translations of the Hebrew Bible to create “proof texts” that indicate the Hebrew Bible predicts or substantiates Christianity. At Messiah Truth, where I am known as “Proteus,” I recently made some remarks on that question; that the participant Ezekah wound up quoting, and questioning himself. I have chosen to respond here.